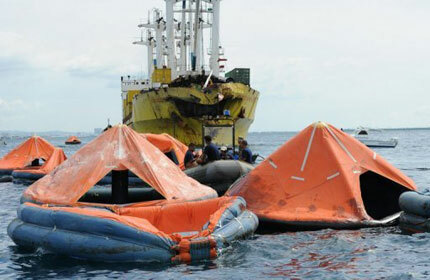 Life rafts from the sunken ferry St. Thomas Aquinas float in front of a cargo ship on August 17, 2013. 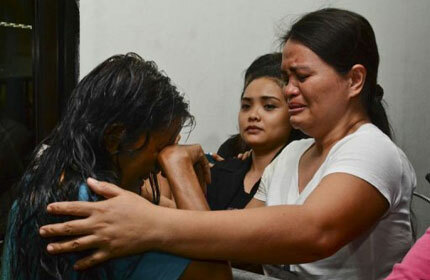 CEBU - The death toll from a ferry disaster in the Philippines rose to 52 on Monday as more bodies were pulled from the water, the coastguard said. 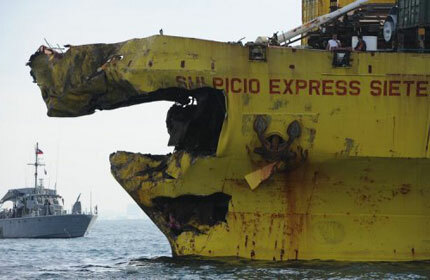 Divers and patrol boats were continuing to search for 68 other people still missing after the St Thomas Aquinas ferry collided with a cargo ship on Friday night and quickly sank near the central city of Cebu, the coastguard added. Navy and coastguard divers have been struggling against strong currents to enter the wreckage of the ferry, which is about 30 metres under water. 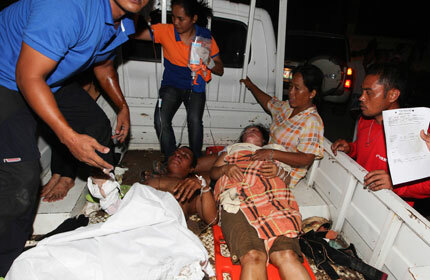 The latest confirmed death toll rose from 38 on Sunday night. No details were immediately given as to how or where the extra bodies were recovered. However an AFP reporter witnessed one bloated body, which had been found floating in the water, being towed to shore by a coastal patrol boat on Monday morning. 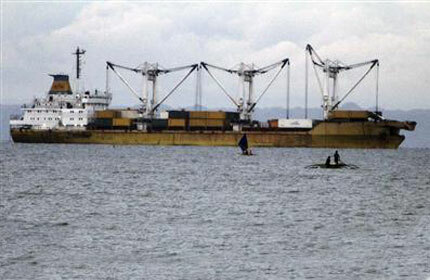 A Philippine Navy boat guards a cargo ship with its bow destroyed on August 17, 2013, after it collided with a ferry. A cargo vessel docked at a sea is pictured after colliding with passenger ferry St Thomas of Aquinas, in Talisay, Cebu, central Philippines. 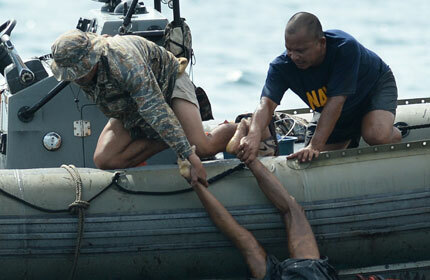 Philippine Navy personnel lift a victim from the sea during rescue operations on August 17, 2013 after a cargo ship collided with the ferry St. Thomas Aquinas the night before off the town of Talisay near the Philippines' second largest city of Cebu. 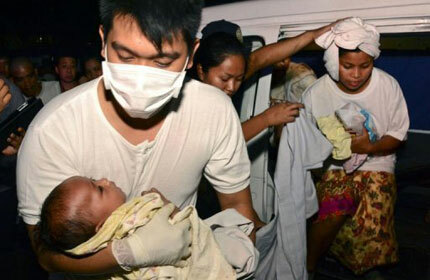 A rescuer carries an infant child survivor of the passenger vessel MV St Thomas Aquinas that sank after colliding with a cargo ship, to a hospital in Talisay, Cebu in central Philippines. A nurse shows survivors the way to the hospital after they were rescued from a passenger vessel MV St Thomas Aquinas before it sank in Talisay, Cebu in central Philippines. 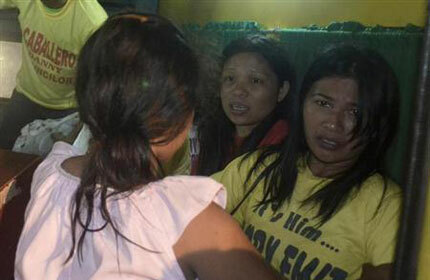 A survivor (L) cries as she arrives at hospital in Cebu after a ferry collided with a cargo ship, August 17, 2013. 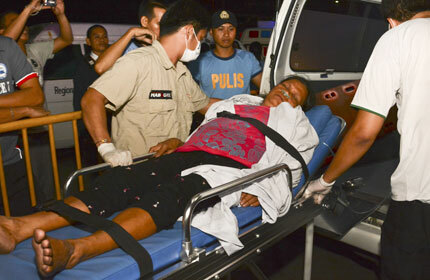 A survivor in a wheelchair arrives at hospital in Cebu after a ferry collided with a cargo ship on August 17, 2013. 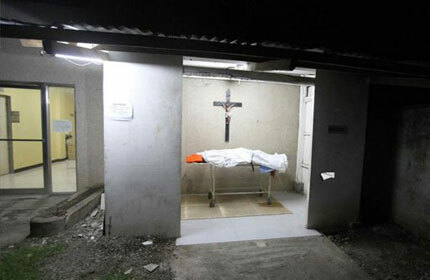 A body lies in a morgue at a hospital in Cebu after a ferry collided with a cargo ship in Cebu, central Philippines on August 17, 2013. 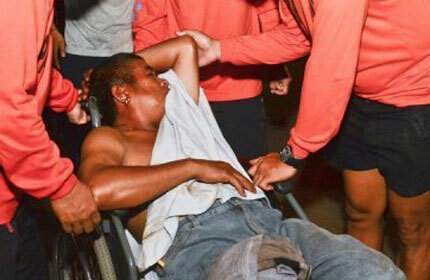 A survivor on a stretcher arrives at hospital in Cebu after a ferry collided with a cargo ship in Cebu, central Philippines on August 17, 2013. Survivors lying on a truck are assisted by a medical team to a hospital after they were rescued from a passenger vessel MV St Thomas Aquinas before it sank in Talisay, Cebu in central Philippines August 17, 2013.